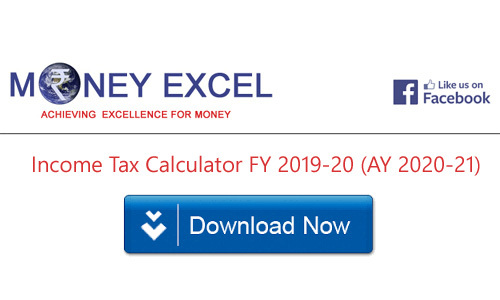 Download, check out simple Income Tax Calculator of FY 2019-20 (AY 2020-21). This calculator also includes recent changes made in Interim Budget 2019 by Finance Minister. As you are aware that Income Tax calculation is one of the most complex tasks for the common man (especially for salaried). To help them here is simple Income Tax Calculator for the financial year 2019-20. It is simple excel based calculator specially made for the salaried people. You can use this calculator for calculating your tax liability for FY 2019-20 (AY 2020-21). Prior to looking at Income tax calculator let’s look at Income tax slabs for FY 2019-20 and recent changes made in Income Tax during budget 2019 by finance minister. Budget 2019 was announced by the finance minister Mr.Piyush Goyal on 1st Feb,2019. One of the interesting points in budget 2019 was instead of changing tax slab, finance minster has given Rebate under section 87A. Rebate means payback in simple terms. Announcement of 5 Lakh tax free income in budget 2019 has created confusion in many people that Income tax slab is changed. However, please understand that there is only rebate, NO CHANGE in Tax Slab. If your income is above 5 Lakh, you can not claim rebate under section 87A and you have to pay income tax above 2.5 Lakh income. Let’s understand this by example. From above example you must be clear that if your income is less than or equal to 5 Lakh you will get rebate u/s 87A and if your income is slightly above 5 Lakh you need to pay tax. After understanding rebate benefits let’s look at other benefits announced in budget 2019. For salaried person, standard deduction is increased from Rs.40000 to Rs.50000. TDS threshold on interest earned on bank fixed deposit and post office is raised from Rs.10000 to Rs.40000. TDS threshold for deduction of tax on rent is proposed to be increased from Rs.1,80,000 to Rs.2,40,000 for providing relief to small taxpayers. Exemption from Income Tax on notional rent on second self-occupied house property. Individual with gross income up to 6.5 Lakh will not need to pay any tax if they make investment under section 80 C.
Accordingly, Income Tax Slab for FY 2019-20 (AY 2020-21) is given below. You can download new income tax calculator FY 2019-20 from the link given below. To calculate your income tax liabilities, you need to provide inputs such as your gross income, exemption amount. In addition to that, you need to provide information about the investment made by you under various sections. In the bottom section, you need to provide selection of applicable tax slab by selecting Male/Female, Senior Citizen and Very Senior Citizen Options. You will be able to see tax applicable in Tax Liability section. Click on the following image to download income tax calculator. CLICK above image to Download Income Tax Calculator in EXCEL Format. Note – It is not a comprehensive calculator, it is designed to give you quick idea about your income tax liabilities so that, you can start tax planning. This calculator is designed exclusively for the salary income only. It is Excel based calculator. You need Microsoft Excel to use this calculator. You will not able to calculate HRA from this calculator. This calculator is for people with a single home. You will not able to calculate long-term capital gain tax from this calculator. I hope this Income Tax calculator will be useful to you. Do share your views in the comment section.